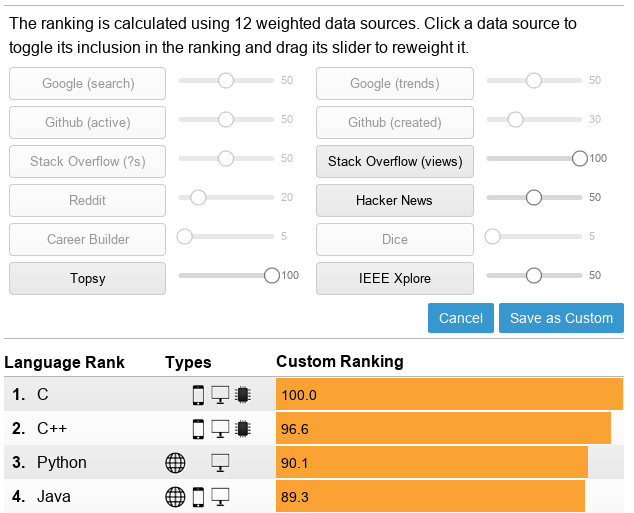 IEEE Spectrum recently came out with a very interesting interactive tool for ranking programming languages. What makes it interesting is that it incorporates 12 different sources including data from code, jobs, conversation, and searches — and you can customize the weights assigned to each source. But the first thing that occurred to me was, this is a fantastic opportunity to look at commonalities and communities across all of these sources. That could tell us about which places could provide unique insight into what technologies developers care about and use, and which provide mainly reinforcement of others. Before I did anything, however, I wanted to test the veracity of the rankings. So I compared RedMonk’s January rankings against an equal weighting of GitHub active repositories and StackOverflow questions. While not perfectly correlated, since IEEE used only 2013 and RedMonk uses all-time, the Pearson correlation coefficient for the top 20 languages is 0.97 (where 1 would be entirely correlated). The strongest correlation on the chart, interestingly, is the 0.92 found between Twitter conversation and Google trends. Apparently, people talking about programming languages in real-time chat tend to also search for what they’re talking about. Google: trends and search. Nothing surprising here. Job sites: Dice and CareerBuilder. Nothing surprising. Reddit and Google trends. Discussion about current topics seems to correlate with interest in finding more information about those topics. Twitter and Google search. The 0.88 here is slightly below the 0.92 between Twitter and Google trends. Most interesting about this pair is that it shows a connection between conversation and amount of content (# of results), rather than just people searching for what could be a small amount of material. Reddit and Twitter. Similar communities seem to participate across a wide variety of online discussion forums. GitHub created and StackOverflow questions. Because it’s a correlation of open-source usage and broader conversation among forward-leaning communities, this is the one we rely upon for the RedMonk language rankings. In the middle (correlations between 0.3–0.7), I was surprised that Hacker News correlated rather weakly with all of the other sources. This implies a degree of independence for this community relative to the behavior of all global developers, and even the subset who participate on StackOverflow. It’s certainly some interesting data to support the saying that HN is for Bay Area developers (and their bleeding-edge “cousins” across the world). IEEE Xplore, which is oriented around academic research, had similarly weak correlations with everything else (HN included). This supports a general disconnect between academia and both general trends (most other sources) as well as forward-leaning communities like HN. Both of these seem to make sense based on my prior expectations, since both of these groups are rather unlike the rest. Three of the top 5 are hardware (Arduino, VHDL, Verilog), supporting a strong audience of embedded developers. Outside of StackOverflow views, these languages are nonexistent in the top 10 with only two exceptions: Arduino is #7 on Reddit and VHDL is #8 in IEEE Xplor. That paints a very clear contrast between this group and everyone else, and perhaps a unique source of data about trends in embedded development. Again, StackOverflow views may be a unique source of information on an otherwise hard-to-find community. However, this only lets us easily look at two-way correlations. If we want to see communities, it could be easier to examine this with a graph, with the connecting edges being the correlations between pairs of data sources. Here’s a visualization of that, only showing strong correlations (above 0.7), and with highly connected nodes shown in red while poorly connected nodes are increasingly blue. Graph layout weighted by correlation across data sources, using a force-directed layout in Gephi. I used a 0.7 minimum threshold for the Pearson correlation coefficient. It’s instantly apparent that some data sources serve as centerpieces that can broadly represent a swathe of communities while others are weakly connected and could provide more unique insight. In particular, note that IEEE Xplore and SO views are missing altogether because they had no correlations above 0.7 to anything else. The most central and strongly connected node, perhaps surprisingly, is Twitter. Google is close by, however, which supports the validity of the oft-maligned TIOBE rankings to represent many communities. However it could be a better choice on their part to use Google trends over search results, based on the strength and number of connections shown above. On the opposite side, being nearly unrepresented without explicitly adding them in, are the two that didn’t appear (StackOverflow views and IEEE Xplore). In addition, largely disconnected sources would be well worth considering to provide additional diversity. On this graph, they’re weakly connected (more blue) and less strongly correlated with their connections (thinner edges) — sources like GitHub active projects and Hacker News. 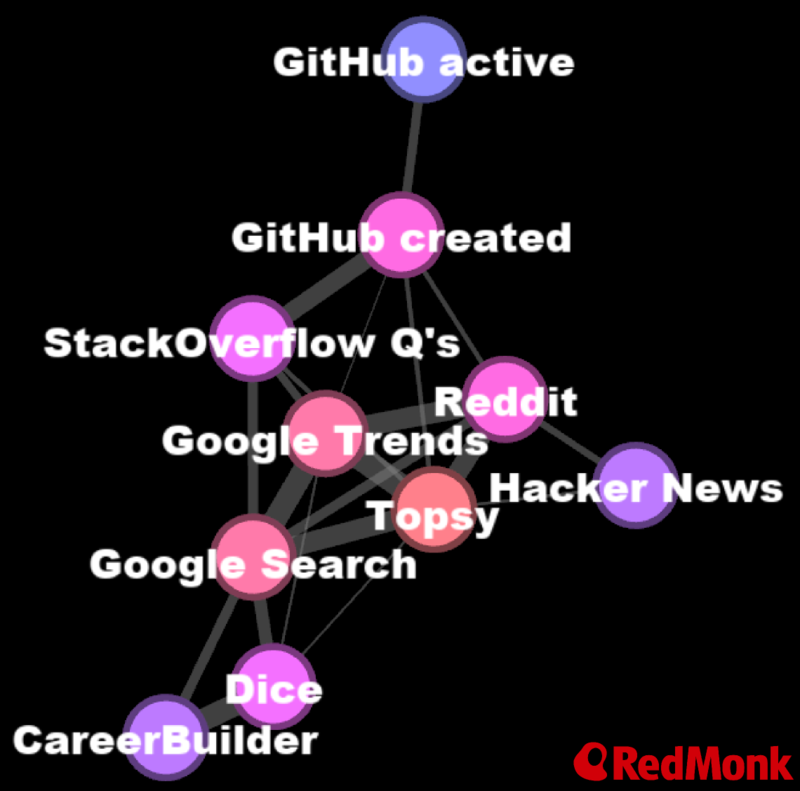 This work revealed a widespread network of communities spread across a wide variety of forums, including code, discussion, jobs, and searches. 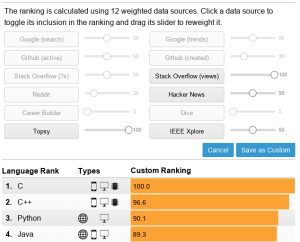 Some of the most interesting results were the exceptions from the norm — in particular, StackOverflow views could provide a unique window into embedded and enterprise audiences, while Hacker News and IEEE Xplore are other sources with quite disparate data relative to the majority of the group. Finally, the connection between real-time conversation on Twitter and existing content on Google was a newly interesting correlation between discussion and resources that actually exist, rather than purely discussion and interest. Disclosure: SAP and Salesforce.com are clients. Microsoft has been a client.